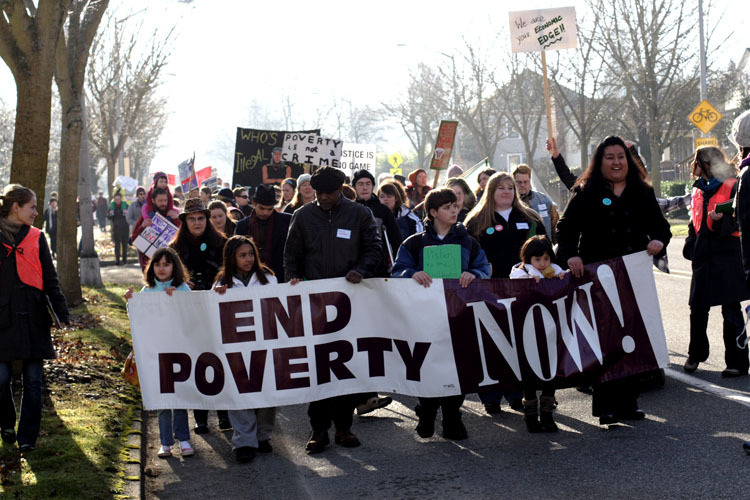 Wait… Does America Need Poverty? The World Bank’s motto is “Our dream is a world free of poverty.” Similar to the World Bank’s motto, I like to imagine a world where everyone is happy, healthy, and living comfortably. I made the decision to become a social worker because I want to help people improve their quality of life and I believe in social justice. So it’s difficult to try to view topics such as poverty and inequality with a different or uncommon perspective. As a future social worker, I want to help uplift people out of poverty. I want to make sure no human being has to go to sleep hungry or worry about how they’ll make it through the next day. Poverty is a real thing, and it’s astonishing how prevalent it is around the world. After all this time, why are there still so many people in a developed and prideful country such as America suffering from poverty? What if the answer to that question is that as a society we need poverty? (Why do I feel slightly ashamed for allowing this thought to cross my mind?) I came across an interesting article and this was the argument that I found in it. The article titled, “Benefits of Poverty,” by Herbert Gans made me think about how we often talk about ways to get rid of poverty and wanting to lessen the gap between the rich and the poor, but maybe the truth is that poverty will always be with us. No matter how many groups or people come together to rally against it. No matter how many welfare programs and policies are developed. No matter how many donations are made. No matter how many times we toss spare change into an old paper cup for someone sitting against a cold brick wall on the street. Poverty will never disappear- because it’s a necessary part of the societal system. This is the idea that was proposed in the article and it made me stop and think. This idea is rarely discussed but does it hold some truth? According to the 2015 US Census, there were 43.1 million people in poverty. The official poverty rate was 13.5% which is down 1.2% from 2014. Even though the rate had declined between 2014 and 2015, 43.1 million people is a significant amount. In addition, the United States has the highest poverty rate of the developing world (“Poverty Program: USA Poverty,” 2016). I find this ironic because America is known as “the land of opportunity.” That is- if you put enough effort and work hard enough, you can live the American dream and climb your way up to the top of the latter of success. Then why is it that there are so many people who still haven’t been able to lay even a toe onto that latter? Poverty is all bad and as a society we must work together to abolish it… in my ideal world of course. However, in the real world, we’ll pretend to believe this but the masked truth is that poverty may benefit the better off members of society and because of this, unfortunately there will always be a level of poverty needed to keep society going. In return, the better off will “help” the poor by creating policies, paying taxes, donating, etc. to keep antipoverty programs going and provide aid to those in need. It has to look like they’re at least trying, doesn’t it? Herbert Gans points out many ways that a society may benefit from poverty; there are economic benefits, political benefits, cultural benefits, etc. As interesting as this idea is, it is very difficult for me to accept and agree that my society (America) needs poverty and that there is a reason to maintain some level of it. But looking at it from this prospective, it makes me wonder why we’ve failed to completely eliminate poverty. Sure, there’s been a lot done to decrease the poverty rate, there are so many programs and charities out there, there are studies and awareness is raised- but why isn’t that enough? Is it because deep down or subconsciously, there is the belief that having some level of poverty in a developed country is needed in order to keep everything structured? Bernadette D. Proctor, Jessica L. Semega, Melissa A. Kollar, 2016. Income and Poverty in the United States: 2015. US Census Bureau. Available at: http://www.census.gov/library/publications/2016/demo/p60-256.html [Accessed 14 November, 2016]. Ravenhill, J., 2014. Global political economy 4th ed., Oxford: Oxford University Press.